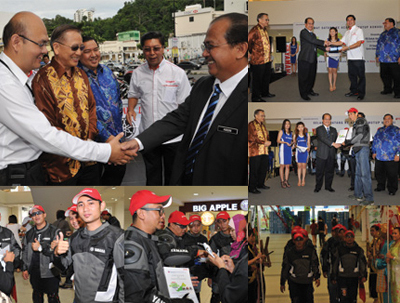 Welcome to Hong Leong Yamaha Motor | YAMAHA TRANS BORNEO ADVENTURE 2011 ENDS! YAMAHA TRANS BORNEO ADVENTURE 2011 ENDS! 23 Sep YAMAHA TRANS BORNEO ADVENTURE 2011 ENDS! A complete success for first ever Kuching to Kota Kinabalu motorcycle convoy ride organized by Hong Leong Yamaha. Kota Kinabalu, 23 September 2011 – The first ever motorcycle convoy ride from Kuching to Kota Kinabalu organized by Hong Leong Yamaha Motor Sdn Bhd ended today. The convoy of 12 riders, comprising local and media representatives rode on three different Yamaha models – Lagenda 115ZR, 135LC auto & hand clutch. They were presented Certificate of Participation by YB Datuk Abidin Madingkir, Mayor of Kota Kinabalu at the closing ceremony of the Yamaha Trans Borneo Adventure 2011. “This Trans Borneo Adventure covered a total distance of approximately 1400 km over a period of six days from Sep 18 to 23 with over night stops at Sri Aman, Sibu, Bintulu, Miri, Lawas & Kota Kinabalu” said Mr KC Leong, General Manager, Sales & Marketing of Hong Leong Yamaha Motor. “One of the main objectives of this motorcycle convoy ride was to promote safe riding habits with proper riding attire of safety helmet, riding jackets, gloves and shoes. There was a “helmet exchange” programme at Kuching and Kota Kinabalu whereby unsafe helmets were replaced with new ones” further added Mr KC Leong. Besides generating awareness on safe riding, the participants visited interesting tourist attractions and tasted local food along the route passing through Sri Aman, Sibu, Bintulu, Miri and Lawas. 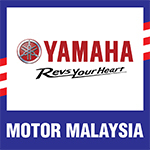 The Pesta Yamaha Trans Borneo 2011 – a fun filled event with Yamaha full product range display – is currently on-going at Suria Sabah, Kota Kinabalu (Sep 23 – 25) in conjunction with this ride.